Makin' it in Memphis: Lunch Date. With my guy being in study mode all the time these days, we have to fit in a moment wherever we can. This past weekend. that involved a little Chick-fil-a lunch date delivery style. 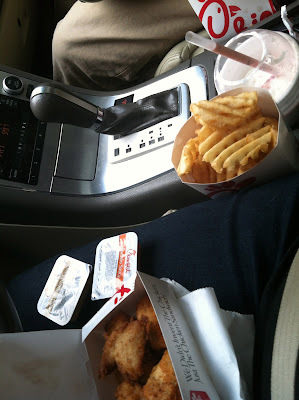 So this is us these days - romantic dates in the car..... eating nuggets and fries. i totally agree about the pepperming milkshakes...love, love, love them, but they are too big...kiddie size please!